Ms. Anne Elizabeth Moore is a rabble rouser and an upstart who is dedicated to overthrowing all of the right things and maybe even some things that you (and I) aren’t that comfortable with overthrowing. She was escorted out of American Girl Place by the cops when she decided to add to the conversation that was happening there; her book Unmarketable: Brandalism, Copyfighting, Mocketing, and the Erosion of Integrity, in addition to demonstrating proper and civilized use of the Oxford comma in its title, is a pointed look at the co-optation of DIY and other punk ethical strategies; she is using WPA archival techniques to document culture in her hometown with the dogged and awesome Revision Street; she has a number of other brilliant projects you should just go check out on her site, including a pdf of a zine that tells you how to make itself (I KNOW MINDBLOWING); and she is off to Cambodia early next year on a Fulbright because even the man she’s taking down knows she’s rad. 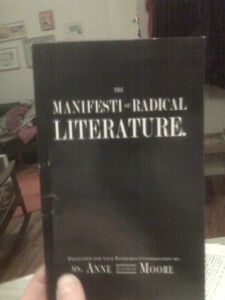 So you can imagine how honored I was when she asked me to contribute something to the new edition of The Manifesti of Radical Literature, which is kind of like the Chicago Manual of Style plus sneakiness and honor and jokes. My modest postface (A real thing! Opposite of the preface!) is hardly necessary to make this a valuable and compelling book, but it is there nonetheless, and I eagerly await the revolution that will begin when you get a Manifesti of your very own. Because nothing in life is easy, you can’t get one right now! But soon they will be available, so watch this space and Ms. Moore’s enjoyable Twitter for details. Get yours here!